Create your own daily planner and photo paper notebook that help you keep your events, appointments or medications organized throughout the day. Wire-bound A5 size personalized notebooks feature your designs printed on sturdy front and back cover, inside front and back cover, high quality paper stock and a durable black spiral binding. One of the great things about our photo writing notebook is that it can be fully customized to fit your style. 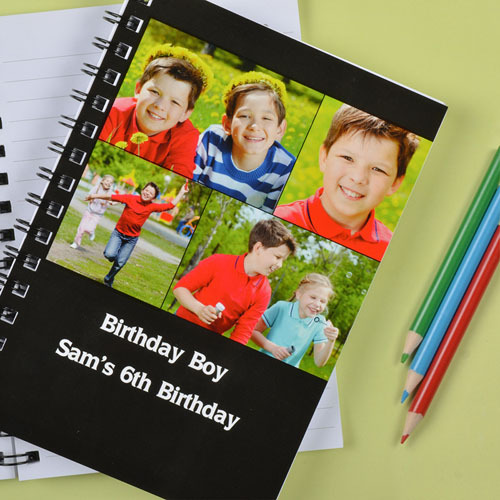 There are many options for the notebooks, you may choose between lined paper, or plain paper, number of pages you create, customize the cover, inside cover, inside back and back with your images and personal message. We offer a variety of photo layout and fun background template to get you started. Cheap personalized notebook work great as wedding favors, birthday gifts, graduation gifts and family reunion keepsake and unique gifts for kids.